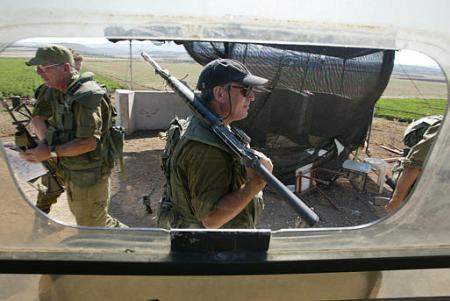 U.S. Mercenary fighting for Israeli occupation. An American Mercenary fights for the Israeli occupation of illegally held Palestinian lands. What country in the world recognizes the Israeli occupation of the West Bank and Gaza? How many U.N. resolutions have been passed that demand an immediate withdrawal of Israeli forces from those lands? But here we have a story (and photograph), of an American who is helping to strengthen, by force of arms, the very occupation that has caused so much violence. Mr. Leventen... you are NOT helping to stop terror attacks against Israel. Only a full compliance by Israel of UN resolutions to withdraw from illegally held territories will bring an end to the bloodshed. Go home Mr. Leventen... morn the dead in New York, and realize that TERROR does not end TERROR.